The following is excerpted from “Coco Cake Land” by Lyndsay Sung © 2018 Lyndsay Sung. Reprinted in arrangement with Roost Books, an imprint of Shambhala Publications, Inc.
“Hidey ho, cacti!” This stumpy little cactus will be the life of your next party. No prickles on this character, just piped lines of buttercream and a loveable kawaii face. He’s a fun little rascal for a Western-themed or Joshua Tree hippie party. Or make him to celebrate that succulent lover in your life. 1. Prepare the cake. Preheat the oven to 350°F. Prepare the cake batter following the recipe instructions. Split the batter evenly between the three prepared cake pans and bake for 15 to 18 minutes. Check for doneness every 5 minutes, as the layer cakes will bake faster than the sports ball pan cake; cakes are done when a wooden skewer inserted in the middle comes out clean. Let cool completely, then chill the cakes in the refrigerator for 30 minutes. 2. Reserve ¼ cup of the buttercream in a small bowl for the cactus flower. 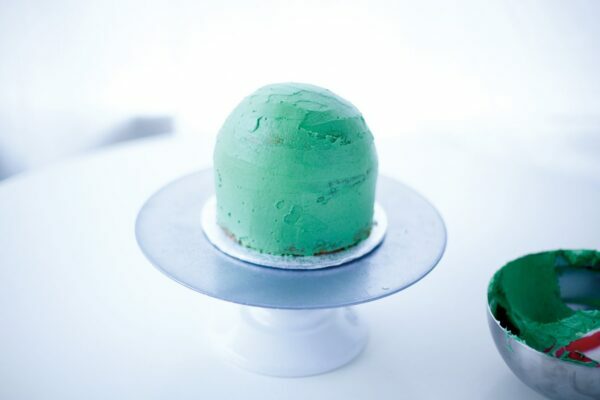 Color the remaining buttercream with the green gel color. 3. 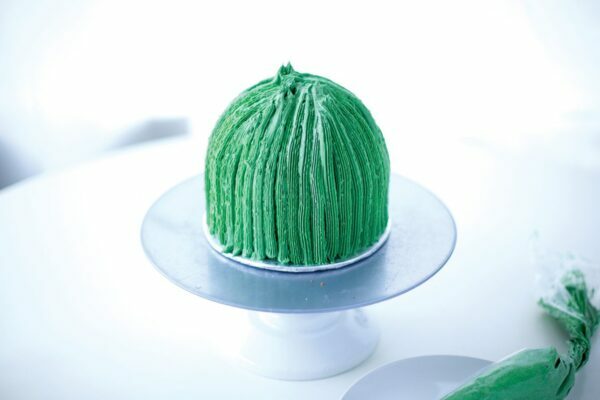 Level, fill, and frost your cake to the crumb coat stage (see page 000) using the green buttercream and using the half sports ball cake layer as the top. (Optional: Insert a bubble tea straw or wooden skewer into the center of the three layers to give them some sturdiness for frosting.) Chill the crumb coated cake in the fridge or freezer for 30 minutes. 4. 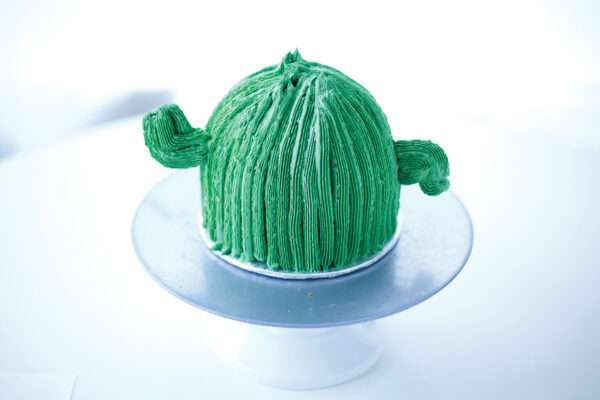 Fill a piping bag fitted with a French open star tip with the remaining green buttercream. 5. Pipe the cactus. Starting at the bottom of the cake, slowly and steadily pipe a line of green buttercream all the way to the top center of the cake. Continue piping lines of buttercream, nestled closely, until the entire cake has been covered. 6. Make the fondant features. Clean and dry your hands completely. Divide the white (or green) fondant in two. Between your palms, roll each piece into a thick log about 3 inches long. Bend each log into an L shape. 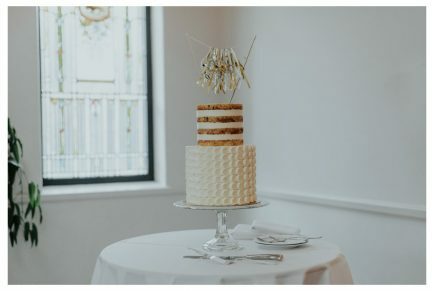 Insert a wooden skewer piece into each L, making sure there’s enough skewer to successfully anchor the arms in place (you will want to insert at least 2 inches into the cake). Gently push the skewered fondant arms into the sides of the cake, with one arm facing up, one arm facing down. Now carefully pipe the fondant arms with lines of green buttercream until they are covered. 7. Tint the reserved buttercream with the red gel color; for such a small amount, you can mix it vigorously with a small spoon. Fill a piping bag fitted with a chrysanthemum tip with the red buttercream. 8. Make the cactus flower. Pipe a tiny amount of the red buttercream onto the flower nail; stick the parchment paper square on top. Pipe a circle of buttercream in the center of the square. Pipe petals around the edge of the circle, pulling upward at the ends, creating little petals that look like scoops. Pipe another round of petals inside and overlapping the first layer, then another layer of petals inside and overlapping the second layer, until you have formed a cactusy-looking flower. Sprinkle the center with white sugar pearls, then place the flower in the freezer for 15 minutes, until set. 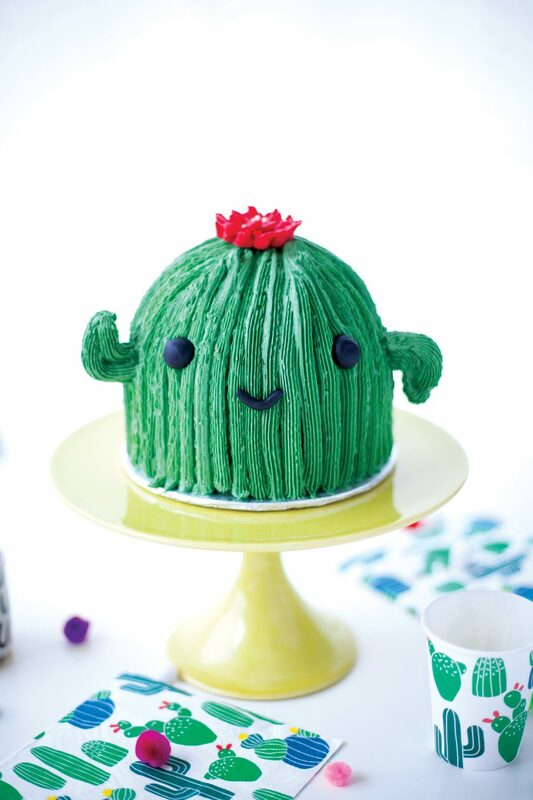 Gently lift the flower from the parchment paper and place it on the center top of your cactus, covering the point where all the buttercream lines meet. 9. Make the fondant features. 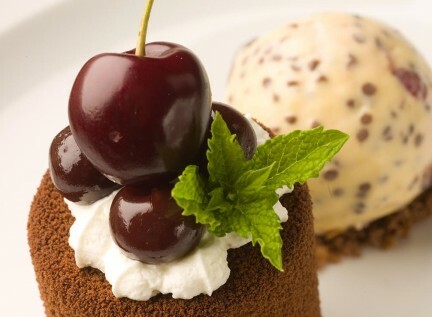 With clean and dry hands, using a small amount of cornstarch to prevent stickiness, reserve a tiny amount of the black fondant for the mouth and form the remaining black fondant into two equal-size balls for the eyes. Flatten the balls and then press them gently into the buttercream just above the halfway mark, setting them 2½ inches apart. (If you feel your eyes might be too heavy for the buttercream to hold them, you can anchor them using wooden skewers cut to size.) Next, make a little black fondant smile by rolling a small amount into a snake shape and placing it midway between and ¼ inch lower than the eyes, pressing it into the buttercream to adhere. If you muck up frosting the fondant arms the first time, don’t panic! 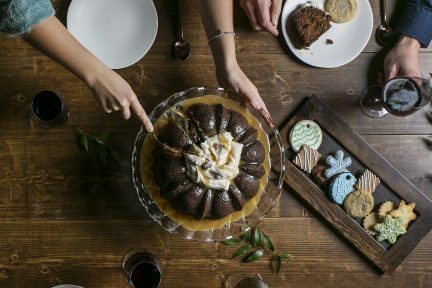 Simply remove the arms, wipe away the buttercream with a clean paper towel, and try again! 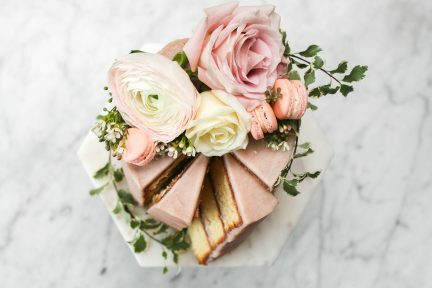 You may want to pipe a few practice chrysanthemum flowers, then choose the prettiest one for the cake. Feel free to also use more than one flower to adorn the cactus. Extra flowers can be stored in an airtight container for up to one month in the freezer. They are great for adding cute flair to future cakes! Here is the complaint I often hear about American-style buttercream: “It’s too sweet.” My Simple Vanilla Buttercream is very simple indeed: unsalted butter, confectioner’s’ sugar, pure vanilla extract, and a dash of milk, if needed. The ratio of butter to sugar, however, is much more sane than your typical recipe and produces a buttercream that is much less sweet. Don’t skip the sifting step—it’s essential to prevent any clumps or clogged piping tips. This is a perfect buttercream that frosts and pipes easily for all your cake decorating and birthday party needs. Makes about 4 to 5 cups. In the bowl of a stand mixer with a paddle attachment, beat the butter on high speed until it is light and fluffy, about 2 minutes. Scrape down the sides of the bowl with a spatula. Add the sifted confectioners’ sugar, vanilla extract, and milk, if using. Mix on low speed to combine the ingredients. Once the sugar is incorporated, crank the mixer to high speed and beat the mixture for another 2 minutes, until it has more than doubled in volume, for a fluffy whipped frosting. Leftover buttercream can be stored in an airtight container in the fridge for up to 2 weeks or in the freezer for 1 month; bring it back to room temperature and rewhip in a stand mixer before using. This recipe can easily be halved or doubled. Discover your new favourite recipe.